The answer may sound pretty basic, because it is! And because of the relative simplicity, you could even make one yourself. How about some lifestyle and preparedness for the outdoor kitchen? A solar oven is a great way to harness free energy to get the job done. So, how do solar ovens work ? Solar ovens work on one basic principle which itself can be broken down into several areas to address: Solar ovens convert sunlight into heat energy. Absorb the energy sufficiently enough to raise the temperature within the solar oven to at least 165 degrees F. And then keep it there (or higher!) long enough to cook your food. Why at least 165 degrees? Because that’s the internal temperature at which meats become safe to eat (beef can be 145). While you should easily be able to reach higher temperatures within a solar oven, in theory even if it sat at 165 for hours, eventually it will cook your meat through and through (like a slow cooker or crockpot). Lets simply look at solar absorption and retainment of that heat. This could be as simple as setting a covered black pot in direct sunlight. The black will absorb lots more energy than other colors (don’t use reflective pots!). But lets take it a step further… If that black pot is setting within an enclosed chamber with a ‘see-through’ (e.g. glass) top, not only will the sunlight heat up the black pot but the chamber itself will heat up too, making it hotter. Now if the sides and bottom of the internal chamber (box) are black, the process of heating will be even more efficient (hotter). But wait, there’s more! If we fashion some sort of reflector that reflects even more of the sunlight into the chamber, we’ll harness even more energy! We can really supercharge the solar oven by insulating the chamber (box) which will keep much of the heat inside (getting hotter!). Additionally, a solar oven that’s insulated will better retain the heat during intermittent periods when the sun may become obscured by clouds. 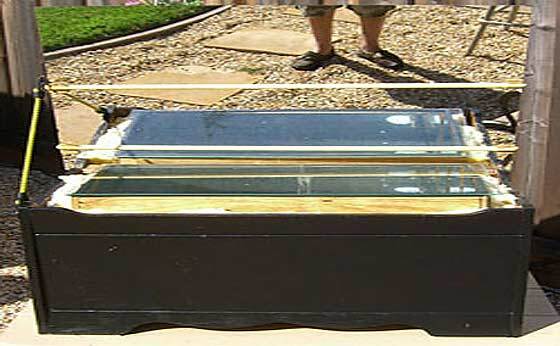 Using the principles above in “how do solar ovens work”, you can build your own (do it yourself) solar oven. Years ago I had built a few diy solar ovens. They were basic rectangular boxes that I cut and assembled out of spare plywood. I had kept some scrap glass around so all I had to do was cut it to the dimensions of the box (for the top). Also had an old mirror which I glued to another piece of wood and fastened it to the solar oven with hinges (and a method of adjusting and holding an angle for reflection). Subsequent versions improved on insulation (built a box in a box with insulation between). I also added a fairly thick piece of metal (painted black) on the bottom which absorbed and held heat). All you have to do is search for solar oven images on the internet to get ideas (or use your imagination). I’ve even heard of a solar oven pizza box! Another option of course is to buy a solar oven already made. I eventually did that. To this day I still have this solar oven which has performed extremely well when I use it on occasion. It wasn’t cheap, but over the years I’m glad I have it. Love my Sun Oven!,…Bread, Muffins, Casseroles, etc. So easy to set up and use! Worth the price point. 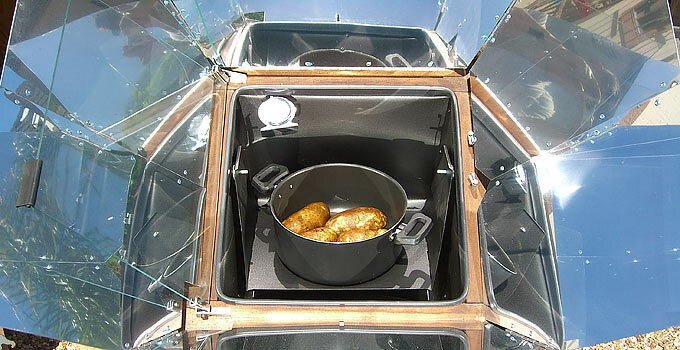 Anything that can be cooked in a traditional oven or slow cooker can be done in a solar oven. The only real restriction is the size of the oven box. Mine easily reaches 400 when empty, 350 when being used. If you keep it precisely centered it can get hotter. It takes longer to heat up than a traditional oven. If you plan to eat by 12, plan on having it heating by 10. You have to turn it to maintain heat, which isn’t a big problem unless you’re cooking something time sensitive, like a cake. It’s big. If you have room, probably better to have a permanent spot for it. It doesn’t heat up the house. So for those of you that have one. if I can’t cook in the house because of no south facing windows without trees blocking and I want to use it outside how Does outside temperature effect it? Like if it is 32deg out can you still use it? You can use as long as the sun makes a shadow. Even in the snow! I love mine. I have had it a couple of years and am very happy I got it! I live in CA. and because of all the smoke from the fires I am not able to use it right now even tho it is hot out. The cooker is insulated, so outside temps shouldn’t affect it a lot. There may be a small decrease if it’s windy, The important thing is the sun hitting the deflector panels directly. I live in the Toledo Ohio area, Solar cooking is just not a good option here. If I lived someplace that had more sun then we do here I would have a solar oven & cooker. Chuck I have used them in Seattle back when it was the rainy city. If you get a shadow you have some sun power. We added bigger reflective collectors and a pizza stone style heat storage inside the cooking chamber. Seems to improve performance. With a Giant Fresnel Lens from an old Projection TV you can celebrate your inner Pyromaniac melting brass and setting fire to stuff. A Parabolic solar cooker can Fry. Give it a try Chuck. Cheap if your a scrounger and fun. I use a roaster pan, 50 cents. Old satellite dish, spray adhesive, aluminum foil, and a grill/grate off an old bbq. Super easy to attach The grill to The dish receiver mount. The mounting brackets on the dish make it simple to track the sun.🌞 If you need to back off on the heat, you can use window screen or something similar.. I use part of an old magic mesh screen door. Spray adhesive & aluminum foil..$2 bucks from the dollar tree. Dish and grill free. In general when you convert a big satellite dish leave a pie slice out so you can reach the cooking zone from BEHIND the dish. Serious eye hazard in front. Also while aluminium foil works it generally tarnishes quickly so using aluminium flashing works better. Modify the satellite dish as so to take the parabolic area OUT of the sun when not in use for safety and to protect the mirror surface.